Pencak Silat is an art and sports complex that has developed in Indonesia for generations as a tradition and culture of Indonesia, especially West Java, since 300 years ago that were previously only as an environmental education mandatory in the kingdom only soldiering. Perfection Pencak as an arts and sports complex seen from the diversity of its aspects, including: aspects of cultural arts, martial aspects, aspects of sport, mental and spiritual aspects. The four aspects are integrated in a form of ethical and aesthetic order motion which contains the value of a noble personality, though both were born and if the inner. 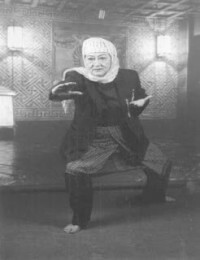 Himpunan Pencak Silat (HPS) Panglipur is a college founded by Abah Aleh in 1909 at Gg. Durman near of Pasar Baru Bandung. 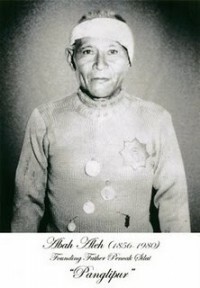 He is a Banten descendant who was born in Garut in 1856 and died in Garut in 1980. Also in his house located in Kp. Sumursari, Ds. Sukasono, Sukawening Garut, that is the village of his mother, Abah Aleh built Panglipur School by opening the first branch of the training place that is named Pusaka Panglipur. Before opening Panglipur school in Bandung, since the age of 18 years, after Abah Aleh finish studying martial arts system in his hometown of Sukawening Garut, Abah Aleh has traveled while searching for his father from Garut to Cianjur and than to Menes Banten.Her father is a family of religious boarding schools that teach science and martial arts in the pesantren. Finished studying at the place of his father, then Abah Aleh wandering went to Bogor, Sukabumi, and Bandung. There he tried a lot of his silat expertise by Pencak Silat masters and champions in the area around Bandung and the maturity of his experience at last he could unite the martial arts experts and establish HPS Panglipur. practice centered on Jl. Dewi Sartika, Gang Panglipur no. 20/81 Bandung. In the city of Bandung since that time there were five branches of Panglipur, among others, West Bandung branch is headed by H.Basuni, in Pagarsih chaired by Abah Bakri, in Ciwidey chaired by Lurah Prawira, in Babakan Jati chaired by H. Basuki, in Lembang chaired by Aki Tarmedi, and in Buah Batu chaired by Bah Soma, in Kopo chaired by Bah Omi, Bah Oyi, and Bah Udi, and many other notables. The branches Panglipur outside Bandung, among others Majalengka, Talaga, Kuningan, Garut, Cianjur, etc. All branches must be under the supervision of the Central Panglipur led by Mrs. Enni. Until this moment Panglipur has been developing rapidly, both inside and outside the country. Besides being a leader Panglipur, apparently Rd. Enny Rukmini Sekarningrat, including martial arts as well as a teacher or coach who is active, he was never trained soldiers Rindam VI Siliwangi, Company Chairman Captain Protocol. H. MSTA. Jhonny (most recently held the rank of colonel), BDI II to train soldiers Siliwangi Pangalengan leadership of Lieutenant Colonel Suryamin, train young men dropping out of school, once coached at the junior high, high school, SPG and students, and students Dodiklat Police and CPM children in Cimahi, train the foreigners who had come to sit in Panglipur. Even had founded an organization named Pedicab Drivers Association of Indonesia (HPBI), then the drivers of Pedicab got the course of steering wheel until they are, be a Bemo driver in Cicendo Bandung. 1. Pek Aranjeun Neangan Guru Luhung Ilmuna, Poma Ulah Ria (arrogant).This means that: Please you are looking for the high science teacher, but do not be conceited (arrogant). 2. Pek Aranjeun Neangan Guru Luhung Ilmuna Pikeun Udageun Rasa. This means that: Please you are looking for the high science teacher who can help us reach the high feeling. Over the years, many have developed various branches of Panglipur.They still include the name Panglipur on behalf of their respective school. For example Rayi Panglipur, Ray Panglipur, Panglipur Jembar Kencana, Panglipur Pamagersari, Panglipur Siliwangi, Daya Guna Panglipur, Trenggana Panglipur, etc. The symbol of HPS Panglipur is Trisula and Golok/Dagger are crossed. This has the symbol as an attack and defense that must be coordinated well and in tune. This symbol is located above the green color as a symbol of fertility and justice with yellow lines as a symbol of a grain of rice that can give life to people and having the character of the higher science of the more humble and noble, well above the black color as a symbol of earth and determination. 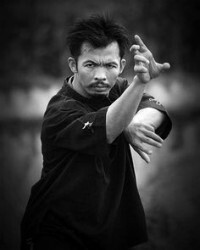 Gan Tatang, who teaches Cikalong style which is a mix of Cimande, Sabandar, and Kari-Madi styles. Mr. M. Tabrani, Rd. Enni Rukmini Sekarningrat, Bapa HMSTA Jhoni, as the central management figures of Panglipur. While in the field of science, including: Haji Adang Moesa (Abah Uca), Bapa Uho Kholidin, Bapa M. Saleh, Bapa D. Hidayat, Aki Tarmedi, Aki Atjen, etc. And than followed also by the next generation, such as: Aa Djadja Widjaja Kusuma (which is also the successor to Peupeuhan Cikalong style), Agus Irwan, Asep Gurwawan, Bapa Didi, Cecep Arif Rahman, etc. Padepokan Kasundan (Padepokan SK Indonesia) as one of the containers in scientific training Panglipur is a small gym but has facilities that support the formulation of martial arts as a means to achieve the level of taste and right understanding of various schools located in West Java in particular generally throughout archipelago and compile them into an effective curriculum, as desired, and can be achieved through training and self-defense in a rational understanding. Cecep Arif Rahman as a trainer and manager of Padepokan Kasundan is a sixth generation of Panglipur which is continuously train himself and research of the martial art system so it will always be open and welcome anyone who wants to train with him.